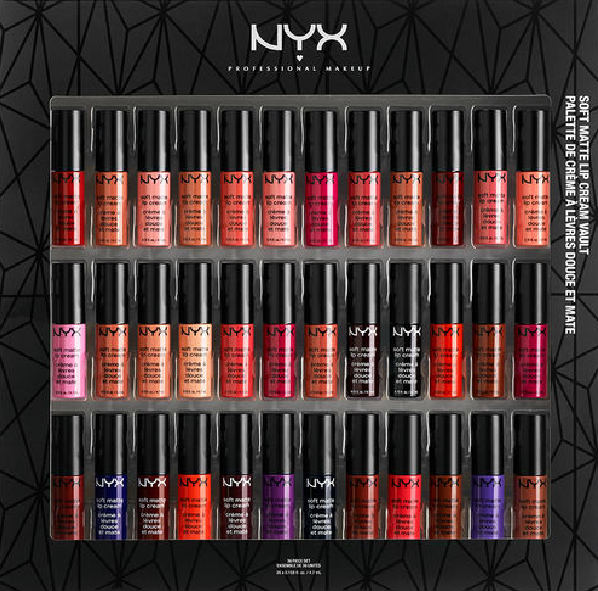 I recently purchased the NYX Soft Matte Lip Cream Vault which has mini versions of all 36 shades in the collection. I’d wanted to try this range for awhile and I wasn’t sure which colours to go for so when the vault was available for a good price, I thought I’d buy that. I’ve certainly never had so many shades in the one product before. I’ve also never been so excited by a makeup product. It’s been really fun to try shades I wouldn’t normally so I thought I’d share my thoughts here. It look me almost an entire day to complete this post! The lip product I use daily and have for many years is Maybelline Provocalips. It’s perfect in terms of texture and staying power but I find the colour range limited. Other than the red and dark red, the other shades don’t appeal to me. So that was my motivation behind finding another brand. In the past I’ve also tried Too Faced Melted which has an amazing colour range but it doesn’t always stay on the lips and ends up in unwanted places on the face. It’s also rather expensive. NYX soft matte lip cream addresses many of the issues I’ve had previously with lip products. There are so many shades I love but at the same time there are many I wouldn’t wear such as the browns and neutrals. I’d like to repurchase some of my favourite shades but it’s so difficult with limited stockists in Australia. I only know of Target and Priceline which have NYX but there aren’t many colours. The NYX website doesn’t ship internationally. I’ll have to work out where I can buy them. Adis Ababa is a medium pink which is similar to many in this collection. I like it but it’s not a particular standout. and in terms of repurchasing I’d probably go with Paris. Copenhagen is my absolute favourite in the collection and I have worn it continually since I bought it. I’ve already used up the sample and need to repurchase it. I look forward to wearing it with the Rouge Noir version of the Dita Cardigan when the weather is colder. It has a red undertone compared to Moscow which is more of a blue undertone and Transylvania which is a purple undertone. That makes it more wearable for everyday. Stockholm is a neutral shade with a pink undertone. As far as neutrals go it suits my skin tone, however I wouldn’t wear it as I always prefer bright lips. Moscow is one of a few dark colours in this range but has more of a blue undertone. It’s a little bold for every day wear (even for me) but since I like it I hope there’s some occasion I can find to make it work. Manila is a coral shade with an orange undertone. I often don’t look good in orange but this is exactly the right amount of orange. It’s a little different from the colours I wear on an every day basis but I like it and I’ll certainly be using it again. Paris is the brightest pink I’ve tried so far in the collection but it’s not particularly unique as many brands have similar shades. It’s one I’d get a lot of use from so I’m likely to repurchase. Transylvania is unique and bold and I can make it work. It’s one of my favourites from the whole collection and I’ve been looking for a shade like this for ages. It has more of a purple undertone in comparison to Copenhagen and Moscow. It will definitely be a repurchase. Abu Dhabi is a neutral with a brown undertone. There are too many shades which look this way in the soft matte range. It’s too plain, the brown undertone doesn’t suit me and I won’t be using it again. At first Sydney was disappointing but after a couple more tries I don’t mind it. It’s not the most flattering shade but it’s fun to wear and I haven’t got any shades like it. The consistency isn’t as smooth as most of the other colours though. Seoul was a surprise. I was expecting it to be more purple from the container; it’s more of a berry pink hue than I thought. It’s a winner and will be a repurchase. Istanbul is a standard and average medium pink. I don’t mind it and favour it over many of the neutrals in the collection, but at the same time it’s not a standout. San Juan is a very bright orange, even brighter than it appears in the pictures. Orange is a new shade for me and I like it. However, I don’t think it could work for every day. I hope I’ll be able to find an occasion where it is appropriate. Havana is one of my favourites from the collection and exactly what I was hoping for; it’s more the colour I thought Seoul would be. I have always loved purple lip shades. It’s very bold for every day use but I adore it too much so I’ll have to make it work. I’ll definitely be repurchasing. Los Angeles is another neutral with a brown undertone. I’m not used to brown tones on myself and it’s not my style. Cairo is my least favourite of all the colours. It’s too plain and looked like I was wearing nothing on my lips. I won’t be using it again. The texture wasn’t as smooth as the other colours and it was very patchy to apply. Berlin is the darkest brown in the collection. I like it better than the other browns and appreciate it is fairly pigmented. However, again brown is not my style. Morocco is one of my favourites and will definitely be a repurchase. It’s a more wearable version of San Juan as it’s less orange and is really a red orange shade. It suits me a lot better than any other orange I’ve found in the past. Milan is another medium pink which is between Istanbul and Paris in terms of brightness. Again, I like it but it’s not a particular standout. I’ll have to choose just one of the pinks I like best to repurchase. I expected Zurich to be another brown based neutral from the container but it has more of a pink hue. It’s one of the better neutrals but it’s a little plain and I don’t have any use for neutrals so probably won’t use it again. Antwerp is similar to Milan but has more of a coral undertone. I’m likely to repurchase it. Tokyo is a pale pink shade which is similar to Sydney but less fun and bright. It’s a little too plain and just another pink which is too similar to others in the collection. The application was patchy too. Cannes is yet another neutral and as far as neutrals go, it’s one of my preferred shades. However, as mentioned previously I don’t think I’ll have much use for it. Buenos Aires is one of my least favourites colours in this range. Again it was patchy to apply and the texture was not smooth. It’s a neutral with a pink or peachy undertone. Dubai is one of the darker browns very much like Berlin. I prefer it to the lighter or neutral browns because it’s richer but again brown doesn’t suit me. Athens is another neutral with a pink undertone. It’s very plain and almost looks like I don’t have anything on my lips. By this point I am so over the neutral tones. There are way too many in this collection. Monte Carlo is very much my style and I will continue to use it. It’s most similar to my current every day lip colour and what I have in a lot of other brands. I was beginning to wonder why there weren’t enough red shades in the range. London is a disappointing shade being another neutral shade with a brown undertone and it doesn’t suit me. Ibiza is another medium pink which is similar to Istanbul, Milan and Antwerp. It’s a little more pale and there are others I like better so don’t think I will be repurchasing. Madrid is my favourite red in this collection and is completely my style. It’s very similar to my everyday lip colour in other brands. I prefer it over Monte Carlo because it’s richer and darker. It’s a very classic shade. I’ll definitely repurchase. Prague is a medium pink, similar to Paris but darker. I like the shade but it’s fairly close in colour to the pinks done by most brands. Bangkok is such a unique standout and one of my favourites. I’ve bee obsessed with purple lip colours since I discovered Too Faced Melted Violet a couple of years ago. Bangkok is a little brighter and even more fun than Havanna. However, that does make it harder for every day use but I’ll make it work because I love it. San Paulo is similar to Ibiza and Antwerp. It’s a lovely shade but there are others I like better. Rome is a brown tone but of all the browns it’s my favourite in the collection. It’s less harsh on my skin tone, because the undertone has a little pink to it. Even though I never usually wear brown, I’d consider using this again. Budapest has more red to it which is evident next to Rome. I like it but prefer the traditional reds like Monte Carlo and Madrid more. Antwerp is a fun and bright red tone, again very similar to many reds I’ve worn in the past. I like it and would wear it again, but prefer the more classic reds such as Madrid and Monte Carlo. Vancouver is a standout. I love how bold it is, there’s almost a gothic feel to it. I’d like to repurchase it. Vancouver is a little more plum or purple than Transylvania but similar. Have you tried NYX Soft Matte Lip Cream? This entry was posted in Makeup, NYX. Bookmark the permalink. Great review, these are lovely! Have a nice weekend. This is so nice and such a llovely post, wuth all the NYX shades you got, tested! I loved Transylvania, Moscow, Seoul, Los Angeles and Dubai. I don't know whether I liked them because I would wear the shades – I definitely would – or because I thought they really look amazing on you! I like NYX and this box with so many colors is great! Hope you have a fabulous weekend! Wow! That's a lot of colors. Great review; I think all the colors look good on you. Have a great Weekend. What a great post! Seriously I am so amazing by how in detail your review was and I like the honesty. I can see why this post took you an entire day to write and take the photos. I have never used this lip product before but I really would like to. I am really liking a few of these shades too! Awesome review and swatches! Love Los Angeles! Omg I need! Fab review! so many shades!!! I think that Morocco is my fav:). Oh wow! A lot of shades, and many look fab on you:) My fave is Seoul! Very interesting lipstick colors, Imogen. I usually go with the pinks and rose colors, so my favorites were Paris, Seoul, Istanbul, and Milan. I was surprised to see that Athens was such a washed out color because when Jess visited Greece, she said the women wore bold make-up and looked so pretty and put together. by the way, I think you would like the Mary Tyler Moore show because she was really into fashion too. Many women got their fashion ideas from her back in the day. Ahh! I had no idea this vault even existed! Thanks SO much for sharing this – it's such an extensive review, I've bookmarked it ready for when I'm next wanting to pick up a new colour and needing to see how it'll look no pale skin 🙂 Have a lovely week! I love NYX! great review! I love these lip creams from NYX I have been using them for years. I do wish they were more hydrating though. Great review. Gorgeous lipstick colours, thanks for sharing! I love these lipsticks !! How fun to have all the shades to try. I often wish I could try more at the store. I have a couple of the full sized versions. I haven't tried these but I should! I love the Monte Carlo on you! They are all gorgeous and you look great with them. Morocco and Milan are my favourites! Wow, so many differnt colors! It must taken forever to take all these photos 😀 thank you a lot for your effort!